Kato Rosa (26) and Japan international soccer player Matsui Daisuke (30) have announced on their respective blogs that they got married on June 22, Kato’s birthday. And they also revealed that the popular actress is four months pregnant and expecting their baby in December. Management for Kato said she is scheduled to attend a charity event on June 27 and will take maternity leave once her current work commitments wind down, such as filming for the movie “Gaaru” (Girl), due for release next summer. One of the up-and-coming actresses of her generation, she has been previously romantically linked with such celebrities as actor Tamaki Hiroshi and Johnny’s Jimusho star Akanishi Jin. Kato visited South Africa in June of last year for a TV show during the World Cup and is thought to have started a relationship with Matsui as a result. He is currently negotiating a transfer from second tier French club Grenoble and he and his new bride will make their new nest wherever he ends up playing. Kato is said to be planning to continue her acting career. We got a call from Japan Post today to say they won’t be accepting packages addressed to Canada while the postal worker’s strike is going on there. Japan Store will continue to accept orders from customers in Canada but please understand that we won’t be able to ship until the situation has been resolved. We’re delighted to announce the opening of the brand spanking new version of Japan Store! We’re crazy about it and we’re sure you will be, too. Not only will you see a totally new design and layout, but the store now offers a host of new features to make your shopping experience that much better. One of those features is this blog, which we’ll use to keep you up to date on developments with the store and occasional tidbits about life in Japan. If you’re looking for jikatabi boots, for example, you can narrow down your search by color, size, fit, height and so on. You can see a shipping estimate right on the product pages. We also now have bulk order pricing for select products and have brought back the ability to view the store in multiple currencies. Later in the summer, we’ll be rolling out new products, upgrading our product photos and making use of a bunch of new features including discount coupons, free shipping on certain products, and a whole lot more. In the meantime, we welcome your feedback on the new store and encourage you to share things you like on Facebook, Twitter and anywhere else you inhabit on the web. And we mustn’t forget to thank the wonderful staff at Richer Designs, who made the transition from the old clunky store to this sleek new version not only a smooth process but also went out of their way to meet every feature request we could come up with. And all in a very cost-efficient way. We recommend them highly for your e-commerce needs. Actress Mizuno Maki (41, photo right) is said to be in a state of shock following the revelation of her politician husband’s extra-marital activities. This week’s issue of the gossip magazine “Friday” published photos of Liberal Democratic Party member of the House of Representatives Gotoda Masazumi (41, photo left) in a clinch with a Ginza bar hostess. At a bar in the Roppongi entertainment district, the pair are said to have disappeared together into a toilet for 20 minutes. The woman is also said to have spent the night at the taxpayer-funded high-rise accommodation for politicians in Akasaka. The facility is provided for politicians based outside Tokyo and only family members are allowed to accompany them. The revelation came the same day as Gotoda’s party led a no-confidence motion against Prime Minister Kan Naoto (62) and his cabinet, throwing politics into disarray at a time when the country needs leadership the most. Gotoda is a member of an LDP panel tasked with coming up with measures to deal with earthquakes and has visited Tohoku several times since March 11. In light of the current scandal, he is likely to step down from all such posts. He has been married to Mizuno for seven years and they have a son (6). A women’s magazine reported in 2009 that the couple were living separately but sources say they have not considered divorce. Talento Megumi (29) spoke yesterday about the recent hospitalization of her husband, Dragon Ash vocalist Furuya Kenji (32). The rock star is being treated for multiple hemorrhagic gastric ulcers, which his attributed to overwork. She said, “I’d heard quite a few people have had stomach bugs, so I was keeping an eye on him. But when he had a checkup it turned out be ulcers. Considering his age, he’s maybe been working too much.” Megumi is currently between projects and is nursing her husband. NHK chairman Matsumoto Masayuki (67) announced yesterday that the national broadcaster will resume live coverage of major sumo events, starting with the upcoming Nagoya basho (grand sumo tournament) from July 10. The sport has been in a serious crisis this year as it reeled from revelations of bout fixing. There have been more than two dozens dismissals and force retirements and even the cancellation of the spring basho in March, the first in modern history. A low profile version of the summer basho was held in May in Tokyo, and described as a “Technical Examination Tournament.” Spectators were not charged for admission and no cash prizes were given to wrestlers. 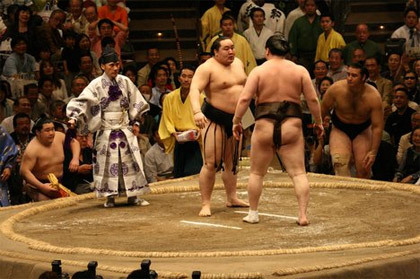 The fate of the Nagoya basho was in doubt until yesterday, when the Japan Sumo Association announced that it would go ahead. Explaining NHK’s position, Matsumoto said that the JSA has taken suitable steps to remedy problems in the sport. He also added what has now become a standard rallying call, saying that people across the country, including those affected by the March 11 disaster, have been calling for TV coverage to resume. Though the sport’s image has been tainted for some time, its current hero is on a path to create history. Mongolian yokozuna (grand champion) Hakuho (26) won the May basho with a 13-2 record, tying former yokozuna Asashoryu’s all-time record of seven consecutive titles. In Nagoya, he will be aiming to overtake Asashoryu and improve his own career total of 19 titles. 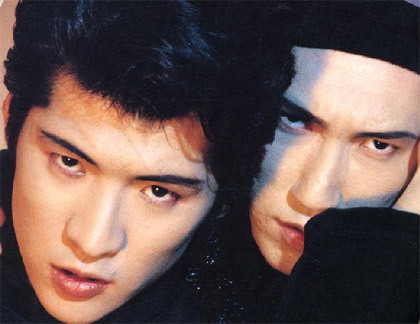 Rock singer Kikkawa Koji (45, photo left) is getting married today and already has a child, it was reported this morning. He and his new bride-to-be, described only as an ippanjin in her early 40s, have been dating since 2007. It is her second marriage but the first for Kikkawa. He announced the news through the website of his fan club.